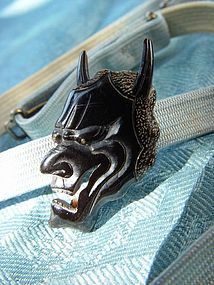 Finely hand carved Japanese Obidome in the shape of a Hannya Noh mask with horns and shiny metal eyes. A Hannya mask in Noh represents a mad woman who turns into a demon out of jealousy. She is vicious and haunts the “other woman” to death. The term, 'Hannya' is used today by a husband who happens to come home late without good enough excuses. He could say (to his buddy) that his wife looked like a Hannya mask when she greeted him at the door.